NCAA QuikVolt 4-Port USB Car Charger - $19.99 - GolfersEdgeOnline.com - Best Golf Equipment On The Web! The 4-Port Car Charger from QuikVolt allows you to charge up to four devices at once. This Car Charger has a 5V/5A output and uses Opti-Charge technology to charge your devices with the power each device needs. The Light-Up ring glows when plugged in, adding a unique light effect. 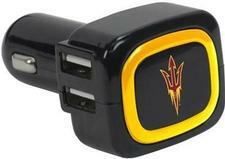 This Officially Licensed product features your favorite team logo and is a great charger for on-the-go use. If you have any more questions about the NCAA QuikVolt 4-Port USB Car Charger; do not see the model you are looking for; need custom options; or prefer to not purchase online, then please call us at (630) 656-1291.